Based on oriental/Aladdin fairy-tales and legends, the fable of Three Wishes slots is familiar to anyone who has ever been a child. This game brings the recognizable charm of the East, including a beautiful princess, a crystal ball, camels, sabers and of course a genie in a lamp, along with numerous playing options, three game features and the 3 Wishes Bonus Round. Naturally, this is not the first genie slot online; NetEnt’s popular Arabian Nights, Aladdin Wishes by RTG and many others. The best casino to play this game would be Slots LV, which is available to all players world wide, including US, and offers a $22 special No Deposit Bonus. 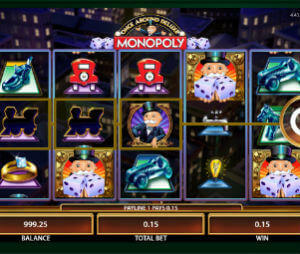 Three Wishes slot machine features five reels, three rows and up to thirty paylines. Betsoft has left you the opportunity to create a preferable set of playing options, since you can select the number of paylines, you can bet up to 10 coins per line and pick one of five coin values ranging from $0.02 to $0.50. There are eight regular symbols representing some dominant leitmotifs in Arabic legends and literature, such as a princess, a camel, sabres with curved blades, a treasure, a crystal ball etc. Wild symbol is a flying carpet whilst a mischievous monkey can activate a special feature. The buttons in the main game are nicely fit in an authentic visual identity of the game. Spin button in the right lower corner looks like a hedonistic cushion, while Bet Per Line, Select Line and Max Bet are lids on stylish jars. Magic Carpet is the most frequently appearing feature in the game. The Carpet icon acts not only as a wild symbol, since it activates The Magic Carpet Feature if it shows up anywhere on reel #1. If that happens, the Carpet will fly to the right, turning icons on its way into Bonus Credits. The Monkey icon in position 2 on reel #3 triggers Click Me Crazy feature, that will bring you some extra rewards. At least three Treasure Chest icons in any position on any reel initiate the Three Wishes Free Spins feature. The most unusual feature in the game is the 3 Wishes second screen Bonus Round, appearing not that often, but rewarding generously. Three or more Lamp icons on an active payline trigger the round, giving you the opportunity to choose between Wealth, Fame, Everlasting Love, Travel, Wisdom and Long Life. Three Wishes is an amusing game, with a coherent and detailed visual design. It gives you the freedom to choose the number of bet lines and is fueled with a couple of interesting bonus features. Every win is followed by some very nice graphics you remember from popular cartoons, allowing the players to get a rather plausible atmosphere of the ancient Orient.